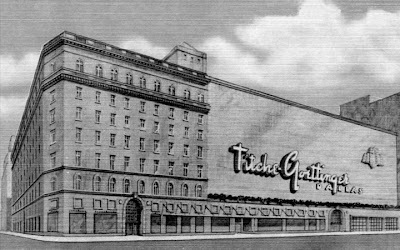 Titche Goettinger also operated a suburban store in the Park Plaza Center in Arlington, Texas. This store was built in 1958 by The Fair of Texas, a high end chain of five stores in the Fort worth area. 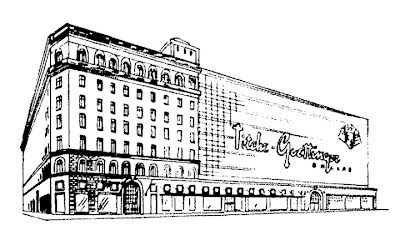 In 1963, the stores were sold, with only the Arlington store going to Titche's. It operated as Titche's until the early 1970's when all Titche's stores were diverted to the name of their sister store in the Allied Group, Joske. 's of San Antonio.The store was about 89,000 square feet, and it operated as Joskes until Dillards purchased the Joske stores in the late 1970's, and the Arlington Joskes store was closed. it is now a discount grocery store. Titche's was late in expanding to the suburbs. Their competition, Sanger Bros., already had several suburban stores by 1960. The Titche's stores at Preston Forest, Wynnewood, and Lochwood were built for The Fair, but were purchased by Titche's in an effort to quickly expand to the suburbs. I don't think The Fair ever occupied them. Titche's was founded in 1902 and was originally a "carriage trade" store. The downtown store pictured above was completed in 1929. Ownership changed around the time of the Depression and it became a more middle-class store thereafter. I still have my Titche's credit card from the '70s! Re: Titche's Photo Studio. Whatever happened to or who might have acquired the photo/proof/negative inventory of the downtown Dallas, TX, store? I am trying to track down photos taken in the late 50's and early 60's. It would be interesting to see where all of the store files/photos ended up. There are some on display inside the building in downtown Dallas, along with original advertisements and the record books. But the only photos from the 50s & 60s are ones in various publications. I have a complete photo album of Titches Dallas 1950's. I can find a way to share them by scanning copying or photographing. Look fwd to hearing from you. There was another Titche's store downtown as well, in One Maine Place. I think Wynnewood closed when the Red Bird Mall store opened. The Red Bird Titche's, like the Sanger-Harris store at Red Bird were #1 in sales per square foot for both chains. They were not large stores but performed exceptionally well. The Sanger-Harris store at redbird now operates as a Macy's although the Macy's store at Red Bird Mall continues to do very well the mall is more or less dead. 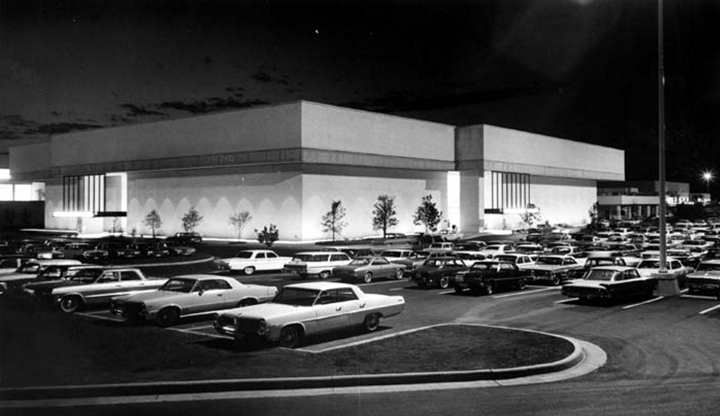 the Preston Forest store was there until Dillard's took over. The downtown store was a beauty and well merchandised until Dillard's closed it. I would absolutely love to know if anyone has any photos or can tell me where I can find copies of the window signs that were painted between about 1935 and 1968. 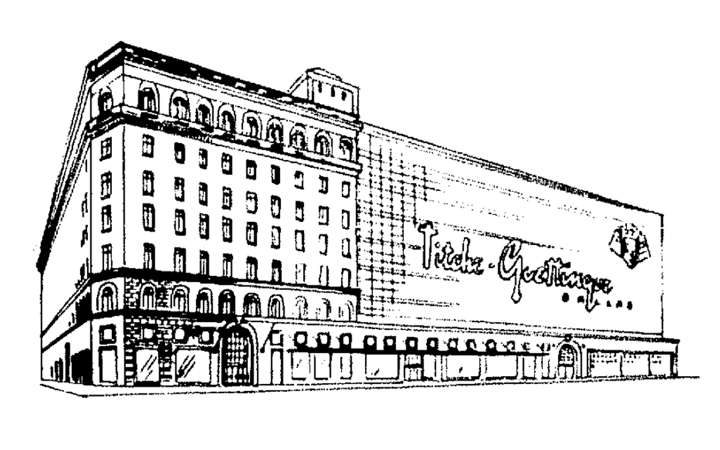 My great-grandfather did ALL the art for the Titche's stores and I would treasure that. I recently found a hatbox from Titche-Goettinger Co. at an estate sale. It has the original sales ticket inside. Although it does not have the year on the ticket, I am assuming it's from the 40's. The box is very plain and drab -- may have been a men's hatbox? The ticket shows the imprint from the old "charge a plate" that was popular in Dallas and could be used in many of the major stores. My mother used to have one and we kept it for many years. Not sure where that is now. 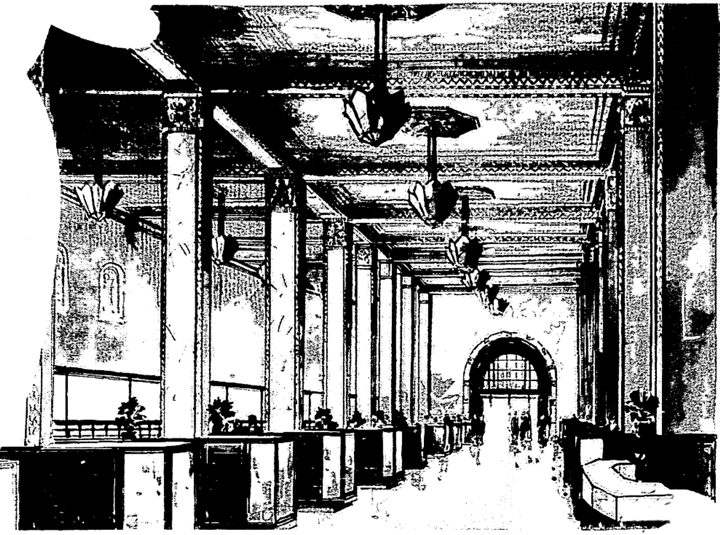 Will L: yes, The Fair of Texas did occupy the Lochwood store, for at least a while before Titche's bought it and changed the name - very modern interior for the times. i recentaly had a older family member pass away and we foung a mink cocktail coat and a hat with a veil on it. Both being from Titche-Goettinger. Just trying to fins some information on these items and where they should go. Can you help? Please keep posting information about this store. I would like to know more about it. 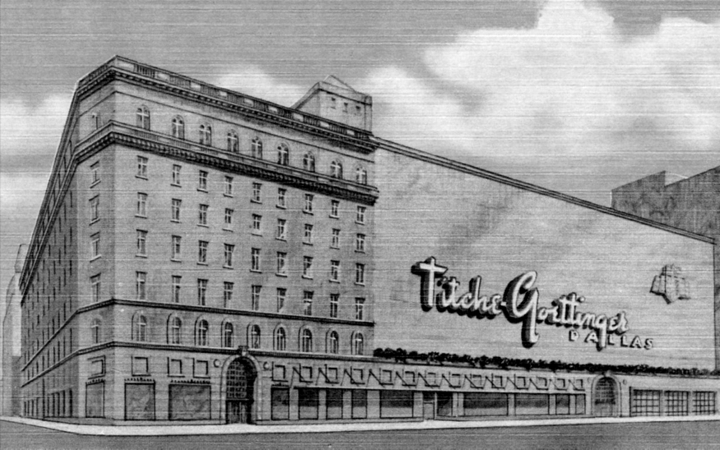 Titche's was originally located in the Wilson Bulding at Main & Ervay Streets. 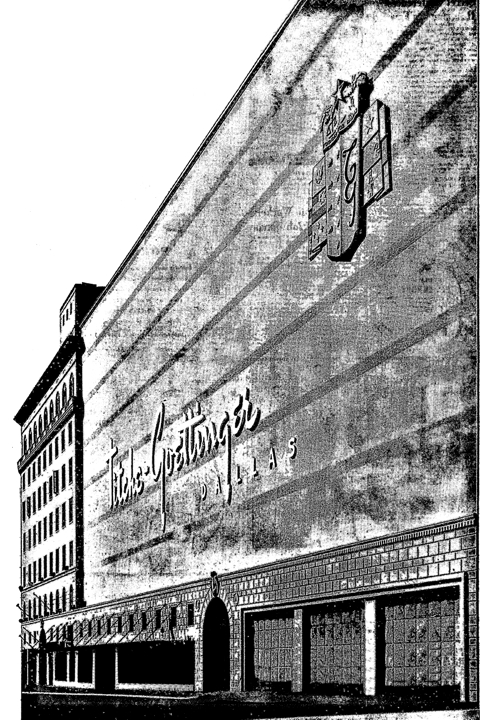 The store moved to the building depicted above at Main & St. Paul Streets in 1929. In 1955 a large annex was built onto the east side of the 1929 building. About 10 years ago i purchased am old antique looking mink jacket from a ventage shop in Plano TX. Stored in my attic all this time and here it is 2013 im learning more on the old Dallas based store (Titches- Dallas) now well known as Dillards. this jacket still carries its original label in it also; stiched in its side the name Geneva Hardgrove and a date of 10/ 20/67. anyone outthere with a clue? My mom and sister used to take me to Titches in north park and Lochwood. I loved it so much. I always loved her copper charge a plate. 50 years ago (Summer of 1963) My family moved from Boston to Dallas, my Father being transferred from Allied Stores, Jordan Marsh to Titches in Dallas. I remember that I wanted to stay home from school that day, because I knew Dad would be able to see President Kennedy. However, I went to school and remember my 1st grade teacher, Miss Walker telling us that either the President had been shot or was dead. Coming home from school, I lived just across the street, Mom was crying. Coming home Dad had told us that he saw President Kennedy just minutes before he was shot. Dad was still at the store, the only democrat out of all the executives who were at the Dallas Trade Mart waiting to hear the President.. Among them was The President of Titches, Mr Lee Starr, who had roomed with JFK at Harvard for one semester. Truly, a fascinating story . . . I have memories of the same day in Detroit - playing in our (semi-finished) basement at age 5, and seeing my mother come down the stairs crying, and saying "someone got a bullet and shot President Kennedy!" I have a Titche's cream Mink coat from around the 1940's I am trying to get in touch with the Museum does anyone know the phone number please???? many thanks! It was the summer of 1965, the summer after my freshman year in college. I returned home to get a summer job to make some spending money, and maybe some money to begin school again come September. Summer jobs had been tough to find early in the summer. Then, word got out that a strike had been called against the huge construction project near Northwest Highway and North Central Expressway. The strike was threatening to delay the scheduled opening of a new shopping center called NorthPark. Rumor had it that college kids were being hired to complete this mammoth project. I thought this meant construction work to finish building the buildings which paid well in those days. I went down to the construction shack and filled out an application. A few days later I received a call to come to work the next morning. The job, as it turned out, was not construction but to set up and stock the point-of-sale stations throughout the Titche-Goettinger store at NorthPark Center. Titche’s parent company, Allied Stores Inc., sent their company vice presidents to Texas to ensure the timely opening of their new store. These vice presidents must have been under enormous pressure to get the store in position to open as scheduled. Our job was to find each point-of-sale station, which was not easy due to the unfinished construction, and then to stock it exactly like every other station with a credit card imprinter, a stapler and the various sizes of embossed paper bags. We had a crew of six or eight college kids led by a store vice president from New York. It was the first time most of us had met, let alone worked with, a New York businessman. He was as skeptical of us as we were of him. Our supplies were so voluminous that they took up the entire area between the inner and outer doors of the south entrance (nearest Northwest Highway) to the store. Each morning we would begin work by stocking our carts with the supplies that were to be left at the various point-of-sale counters. We worked hard for two or three weeks getting the stations set-up for the opening, and actually finished sooner than projected, making our VP a hero. Before he returned to New York, we took him for Texas-style barbeque. He promised those of us who began and finished the project that he would place a note in our personnel files that we could always work for Allied Stores. The sales floors were busy with different work crews setting up and later stocking the store fixtures. It seemed a busy place, but it was quiet as a tomb compared to what was to come. The mall’s grand opening can best be described as humanity unleashed. I had found a strategic location, and when the huge doors to the mall opened, there was truly a human flood. I had never seen so many people. After the VP departed, we became stock boys with khaki uniforms that had our names stenciled on them. As merchandise was received, we would route it to the appropriate department, then help the department manager put the merchandise on display for sale. This involved uncrating and setting up the displays for various kinds of merchandise, which led to the creation of a bulk wrap station for mailing or shipping merchandise to customers, as well as receiving and processing returns. That summer I was given the opportunity to work in several departments and to learn about retail store operations. When I returned to school, I thought no more about my work as a stock boy. The following December, I needed some Christmas money, so I thought I would test out what that VP had promised about always being able to work there. Sure enough they put me to work right away. I worked that Christmas season, the following summer and subsequent Christmas seasons. Titche-Goettinger ultimately became Dillard’s Department Store, but I will always be grateful for the lessons learned, the people I met, and the honor of a man that kept his commitment to a bunch of college kids. I worked for Titches/Joskes for 12 years, 1971 through 1983. I started off in The Towneast store and Later Moved to the Northpark store. I have been lucky to have spent some time doing some work in Most those stores, Been in all the old Fair stores. The stock rooms of several Did have stamped Fair Brothers markings in the stock rooms. So It would appear they had at one time been opened as Fair stores. I Do not think there is a store in the Dallas Area I had not been in or did some kind of work in it. Would mention There was no mention of the Preston Wood mall store by any one I seen in this Article. It was a very Nice store. Could not believe that mall was closed. I had been all through the Down Town store it was very Nice with all the Antique decor. I have been to the San Antonio Down town Joskes that was by the river walk it was nice and a lot Like the Dallas Store. Titches/ Joskes was a great place to work, Great Benefits for its employees. Allied Corp was a great Place with many major Store chains belonging to the Allied Corp.
my first job was titche's town east as a "flyer". I worked any department they needed me in. the years were 1973-76, I remember the restaurant they had downstairs where once a year they would hold a fashion show. all of the departments personnel & family members would model the latest fashions. marina Oswald worked there at the time, I worked with her many a day. she was very sweet and very quite, a hard worker. her daughters were beautiful and walked in the fashion show also. after awhile I settled in the men's department, remember those quiana shirts, lol. disco danny's would flock to get those things and they were so hot to wear. although, they did look good on the right body, lol. We moved to Dallas from Woodland Hills Ca in 1963, I was 5. Back then it was normal and safe to live in the city and of course the only place to shop in a Dept. store and most stores was downtown. Downtown Dallas was spectacular back then and crowded on the streets every weekend with all the shopper as if you were in NYC. At least it seemed that way to a little girl. 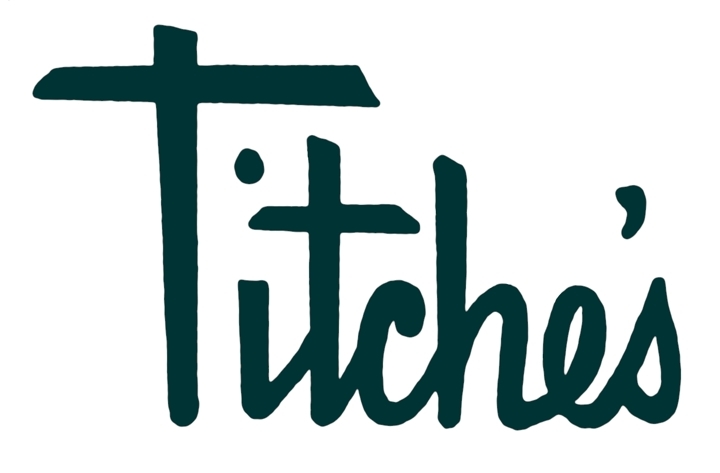 My sister 10 years older than me loved to shop and Titches was her main store. My favorite memories were at Christmas with all the beautiful Christmas window displays and the indoor Christmas train and all the decorations. I guess you could say the movie "A Christmas Story" comes about as close as you can get when describing the inside of Titches at Christmas. Wow, I miss those days. Now its Malls that you have to be afraid of, and times have just changed everything in the way of shopping. Where was the Lochwood location? New to Dallas and curious about this location. 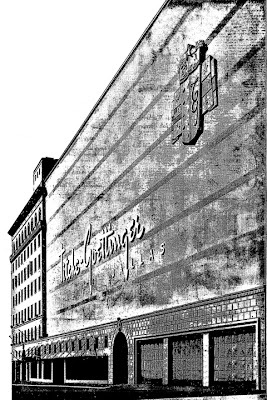 Wasn't the Titche-Goettinger Building between Elm and Main at St. Paul in downtown Dallas where they had Santa Land downstairs? I remember it as being a wonderland for me as a child. There was a train that road around beautiful Christmas scenes and you could get a picture with Santa. This was in the 1960s. Does anyone else remember? I do. There was also one up stairs. Six floor I I remember correctly. I worked there after my day time job at the First National Bank Bldg from 6-9 10 on Thursdays. I drove the train and also help drive the mechanical elevator to that floor. Loved it! I remember the Santa Land and all the toys in the 1960's. We lived in Grand Prairie and my mom, sister and I would ride the bus to Dallas with the sole purpose of visiting the Titches Santa, looking at all the toys, and having lunch at Woolworth's or Greens before heading back home. Great, great memories. In Texas, Two that are not on your list,Carls dept store, San Antonio, Tx and Rhodes Department store, also in San Antonio, both have been closed a long time. OH,and of course, Dillards, which is still in business..
We moved to Dallas in 1957, when I was 11 years old. All of the department stores and movie theaters were in downtown Dallas then, and people got dressed up to go to them. Even at 11, I put on nylon stockings, held up by the garters on my girdle -- this was before pantyhose -- a pretty dress and shoes and gloves. It was like going to church, only actually even more formal than our Church, to which we did not wear gloves. There was a coffee shop on the Mezzanine. After shopping, we would go up there -- my Mom, 2 sisters and I -- and become "ladies who lunch." The food was light and fancy, kind of like you'd imagine for tea. They still had streetcars, or -- at least -- streetcar-type buses, that were powered by overhead cables but ran on regular tires, not tracks. It was a whole other era. and left me three pistols one i was never aware of It was put away separately along with a box of ammo .38 special. The handgun is a Smith & Wesson .38 military & police model 10-5 still in the original box and looks brand new. both the box of ammo and the box the handgun came in have a price tag on them with the name Titches on each tag. My reason for the research is to find some type of sales receipt or ownership paper work or something that i can use to put this hand gun under my name. just curious. I don't even know if the store is still around. any comments will help. Titche-Goettinger Co. Co- Workers Charga-plate on it, signed by my mom, Mary L. McAbee..now she married my daddy in 1956 and became a Leslie. I understand from other family members that she worked there as a teenager and she was born in 1925 so, I would say sometime in the early 40's! Omg what a treasure Ive found! We used to get all dressed up to go to town with my aunts and grandmother (who I NEVER saw in pants) to go shopping downtown... I remember the elevator operator at Titche-Goettinger; I was probably 5-6 years old and wanted to do that when I grew up cuz he got to see all the fancy people! And at the end of the day my Me Maw took us to the Russell Stovers store on the corner by H.L.Greene's! Wow I love memories, they're the good stuff money can't buy!! And yes, we went to the Majestic!! Does anyone know whether small, original paintings were sold in the store? Titche's never had a store at North East Mall in Hurst. 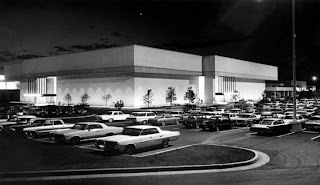 That mall's anchors in 1971 were Leonard's, Stripling's, and JCPenney. Montgomery Ward and Sears were added in 1978. This store franchise has a very sentimental value to me. My Dad worked at the downtown Dallas Titches in the men's alterations dept. for about 40 or so years, and he met my mother when she worked there in the cafeteria, in the 1950s. I have fond memories of going downtown to visit my dad at work when I was a child, and then a teenager. In my high school years, I worked as a part-time sales floor clerk at the, later, Joske's dept. store. My father worked at the downtown store from 1951 until they closed down, then he retired. He and his mates would go to HL Green's down the street to have lunch st at lunch counter. He said they had the prettiest girls work there. He met my mom who worked there on lingerie and they married in 1953. My mother worked at the original downtown store as a sewing machine salesperson. In those days, even as a nine-year old, I could take the Ervay St streetcar downtown by myself (different times) to go to the bakery and coffee shop on the mezzanine just to get a warm cinnamon twist. I've never found another cinnamon twist as good as I remember the ones I got at Titche's. I loved the BBQ sandwiches from the deli in the basement from the stairwell on Main Street.Cheap too! I don't remember how much. I worked in Santa Land on the top floor for Christmas in 1967-1968. It was so beautiful. Such good memories! I would love to see the album of Titche's in the 1950s. Email me at bakgraphics@comcast.net. My mom began at Titche's in the mid 50's dressing the windows. She spent the rest of her career as the Special Events/Public Relations Director for Titche's, Sanger Harris and Leonards. If you attended fashion shows, celebrity appearances, Breakfast with Santa and the Easter Bunny, even the grand openings of Titche's/Joskes at the shopping centers, then malls, etc. thank her for making them all a success. I have many photos and newspaper articles I would love to donate if museum is still up and running. contact mccarrolldebby@yahoo.com.